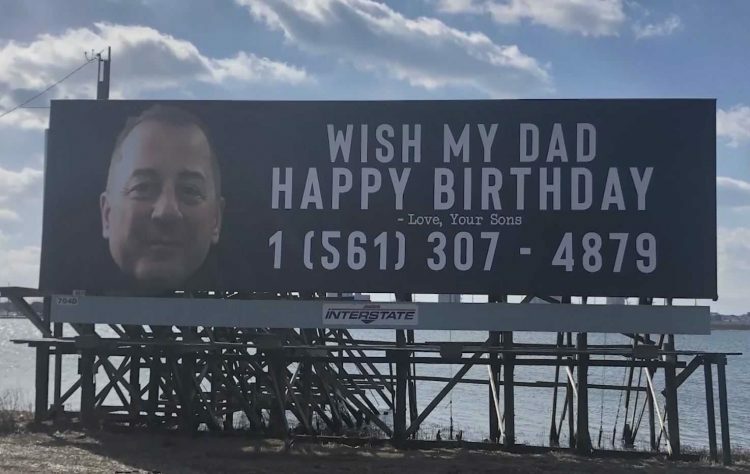 A New Jersey man will never forget 62nd birthday after his sons posted his phone number on a large roadside billboard inviting people to call and wish him well. So far, he has gotten over 15,000 calls and texts from people all over the world. Chris Ferry’s sons used to prank him when going to restaurants by telling waiters that it was his birthday just so they could watch him squirm uncomfortably as they brought him cake. This year, they took things to a whole new level by renting a billboard outside Linwood and posting their dad’s phone number on it, inviting people to send him their best wishes. They thought it would be something of a local joke, with their dad getting a few calls from random strangers, but after the photo went viral on social media, things got a bit out of hand. The billboard went up on March 6, and by March 12, Chris Ferry had already received well over 15,000 birthday calls and texts from people in countries like the Philippines, Kenya, Luxembourg, Ireland, Guatemala, Nepal and Australia. He actually tried to take every call and answer every text at first, but he eventually gave up and changed his voice mail to “thank you for calling to wish me a happy birthday, I really, very much appreciate it…”. “I can see my texts go from 10 or 20 to over 600 in a matter of minutes,” Ferry told reporters, adding that he has been unable to use his phone normally ever since the craziness began. Chris learned about his sons’ prank last Thursday, when he got a call from a man named Nick who wanted to wish him a happy birthday. “How do you know it’s my birthday coming up?” Ferry asked, to which the man responded “I saw it on a billboard”. “(My dad) drove immediately to the sign and took a picture with it,” one of Ferry’s sons told CNN. Considering that Chris’s 62nd birthday isn’t until March 16, he’ll probably get a few thousand more calls until then, but the really bad news is that the billboard isn’t coming down until April, so the madness isn’t likely to stop anytime soon. Still, he’s laughing about it, so his sons have suggested that next year they may rent an even larger billboard.